I’ve been sitting on this news a long time, but I can finally share that I’ve had my first article published in a respected birding magazine. That’s right, you can now read my inimitable blatherings about birds and blogs both online and in print. How cool is that? Some of you, mainly those with enough actual experience observing avifauna to know that I’m not the best bird-spotter around, may wonder what unique insights I might offer the discerning readership of a major industry publication. While it’s true I’m not be as accurate in separating scaup or shorebirds as some (yet), I do know a bit about birding blogs. In fact, there may be no greater fan of the form and its myriad practitioners than me. This is the topic I expound on in the March/April 2007 edition of Bird Watcher’s Digest, an issue with clear collector’s item potential. 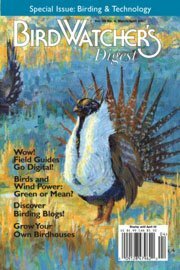 You’ll have to pick up the new Bird Watcher’s Digest to read my full disquisition on the intersection of birding and blogging. However, the BWD website shares a couple of interesting tidbits from my article. The first is the untold though not untoward story of how 10,000 Birds was born, the second, a list of many of what I consider the world’s best blogs to discuss wild birds. Of course, this list is painfully partial; a more complete catalogue of my favorite nature blogs can be found on my links page. It’s also a good example of how far magazine editors have to plan into the future… since I submitted the article, no fewer than three sites on the list changed URLs. But what hasn’t changed is that I still love them all! Many thanks to Bill Thompson, III for graciously offering me space in his fine publication to share my thoughts on a subject I’m passionate about. With hope, readers will discover the inspiring abundance of brilliant wild bird writing (and writers!) those of us in the know already take for granted. Mike, Congratulations! Now … where can one find Bird Watcher’s Digest in Midtown Manhattan? I’m going to try Hudson News tomorrow at Grand Central Station. Great news Mike, there is no one better qualified to write on bird blogging (blog birding?) then you. I’ll have to have my sister track down a copy for me. Clearly it will be a collectors item (sort of up there with a Wayne Gretsky rookie card). Congrats to you! Can I tell people I met you before you were famous? Congratulations mike, that was big step! Congratulations, Mike. I’ll go get a copy immediately. Does your article talk at all about the geographic distribution of birder blogs? It seems like most of the ones I read regularly are in the midwest — which could be because BoTB is some sort of nexus of communications — and I’d like to find more birders who blog about the northeast, the Gulf of Maine bioregion. Is our New England reserve so strong north of where the Gulf Stream meets the Labrador Current that we’re too reserved to blog? I know of two Maine blogs: Birding in Maine by John Briggs and Field Notes by Derek Lovitch. The Plover Warden Diaries is also based in New England, but is only updated during plover nesting season. There are probably others as well. Mike, is this on shelves yet? I went to 2 bookstores and I only found the old issue at B&N. I don’t think Borders carries it.